Vista Del Monte Co-op is located in North Palm Springs with a beautiful mountain view of the peaks of the San Jacinto Mountains. This community of 51 apartments sets back off the street to give a peaceful atmosphere of serenity for independent living aged 62+. Vista Del Monte Co-op is nationally recognized as “A Community of Quality” by the National Affordable Housing Management Association. The property was completed in 1998. Vista Del Monte Co-op is an established smoke-free community. It is not permitted to smoke in your apartment, nor in any common areas, nor outside the building within 25 feet from any entrance or apartment windows. 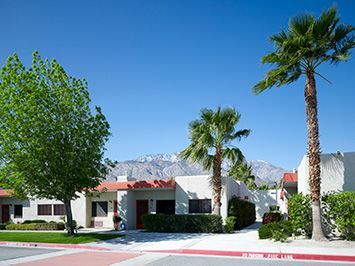 Resident members enjoy their one- story garden apartment with a front patio giving them a place to sit and enjoy a day in the sunny fresh air of Palm Springs when they are not participating in their monthly meetings, and many community activities. The community room is a place where you will find a showcase filled with great items; Friday morning friendship club with coffee and fresh muffins, holding exercise classes twice a week, or just enjoying a social setting with one another. There are many dinners, parties, and social events that give everyone a chance to participate in this active community. Vista Del Monte is located within walking distance to many stores, banks, post office and restaurants. We are also just down the street from down town Palm Springs where there is many stores, museums, movie theaters, and lots and lots of mini shops. Palm Springs is home to the Palm Springs Follies that you won’t want to miss. The Palm Springs Aerial Tramway near the Chino Canyon is very close for a mountain adventure. The co-op is also near the Movie Colony that boasts many icons and celebrities from years past and present. The warm summers are good for many people’s overall health. There is a breeze on the north side that comes through and helps keep the summertime comfortable. Our beautiful community of lush landscaping is affordable for everyone. Every unit has subsidy and resident members pay only 30% of their income for rent. Vista Del Monte co-op is a senior community where you will find a friendly place to call your home. Welcome! Vista Del Monte Co-op is proud to be recognized as a NAHMA Communities of Quality Corporate Partner. This designation is for multifamily properties that have achieved a high standard of excellence in the way they are managed, the services they provide residents, the experience and training of personnel, and other criteria.